SO good! Great casserole for a potluck or watching football!! Everyone LOVES this recipe! Chicken, sour cream, cream of chicken soup, buffalo wing sauce, cheddar cheese, tater tots and celery. Can make ahead and freeze for later. In a large bowl, mix together chicken, sour cream, soup, buffalo sauce and cheese. 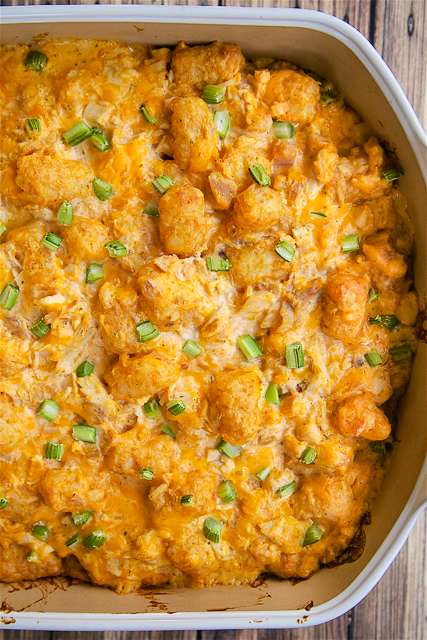 Visit Buffalo Chicken Tater Tot Casserole @ plainchicken.com for full instructions.